Health insurance, more commonly known as Mediclaim, provides a comprehensive cover for medical expenses related to sickness and accidents. Unlike other investments, health insurance does not help in achieving any definite future goal, but nevertheless, it is an extremely important component of a sound financial plan. Changing lifestyles, stressful jobs and rising healthcare costs are some of the many reasons that health insurance plans are becoming more and more popular. A health insurance plan can cover you and your family financially in times of serious illnesses or injuries. Apart from the financial security in times of medical emergency, health insurance plans are also advantageous for reducing your tax-liability by the way of deductions from the total taxable income. The premiums paid towards health insurance plans for you, your family and parents are eligible for tax deduction under Section 80(D) of Income Tax Act, 1961. As per Section 80(D), one can claim deductions for the premiums contributed towards a health insurance plan by an individual or HUF from the total taxable income. This deduction is over and above the limit of Rs. 1,50,000 under Section 80(C). For the Financial Year 2017-18, under Section 80(D), one can claim a deduction of Rs 25,000 per annum for a premium paid for a health insurance plan covering self, spouse and children and additional deduction of Rs 25,000 per annum for premiums paid to cover their parents. For individual above the age of 60, this limit is Rs. 30,000. While the total tax-deductions which can be claimed by an individual at the time of filing of income tax return would vary on the age of the persons insured. A taxpayer who is below the age of 60 can avail a maximum deduction of Rs 55,000 for contributions made towards the premiums for self and parents and for those taxpayers who are above the age of 60 the deduction can be of Rs 60,000 (Rs. 30,000 for self and Rs. 30,000 for parents). These deductions can be made irrespective of the fact whether parents are dependent on their children or not. Even if they have a health insurance plan you can still claim tax benefits for your contribution made towards their health insurance plan. 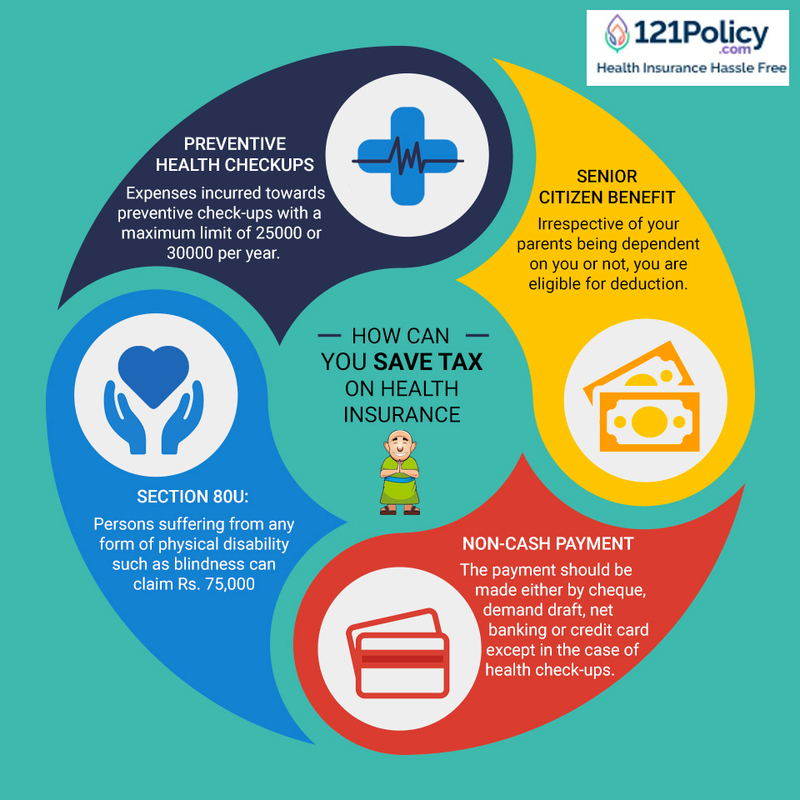 Within the maximum limit of Rs 25,000 or 30,000, as the case may be, expenses incurred towards preventive check-ups are also eligible for tax benefits. Such check-ups are eligible for a maximum benefit of Rs. 5,000. However, this benefit is only available for the preventive health check-up and not for check-ups done during the course of a treatment. The premium paid, towards medical insurance riders or for critical illnesses in a life insurance plan is also eligible for tax deduction under Section 80(D). Thus, one is not restricted to only health insurance policies for such benefits. To avail the tax benefits on health insurance plans, payments made for the premiums can be made in any mode but cash. Thus, to get the benefit of taxation on your health insurance premium, the payment should be made either by cheque, demand draft, net banking or credit card. However, if the payment is made for preventive health check-ups, then such payments are eligible for deductions under 80(D), even if the same is paid by cash. Also, the premiums are eligible for deduction only if they are made from your taxable income and not gifted and such premiums can be paid in instalments but the annual amount paid in a given year is considered for deduction at the time of filing taxes. To conclude, health insurance plans provide excellent opportunity to reduce one's tax-liability and you must make the most of it but the primary reason to invest in such plans should be to give yourself sufficient financial cushion for any kind of medical emergency to you or your family members. Why Health Insurance is necessary in Financial Planning? The insurance decisions you make should be based on your family, age, and economic situation. There are many forms of insurance and, unfortunately, no one-size-fits-all policy.